Frankfurt Musikmesse 2011: Most musicians immediately associate the name Ampeg with its iconic SVT and B-15 bass amplifiers that have graced some of the most important recordings and biggest concert stages in the history of rock 'n' roll. That said, those of you in the know will be well aware of the classic stompboxes, modelling software, guitars and indeed guitar amplifiers that have been released under the Ampeg banner over the years. Just ask Josh Homme or Keith Richards about those chewy, overdriven Ampeg valve tones. "Ampeg today re-enters the world of premium guitar amplification with the announcement of the GVT Series guitar amps, due out this summer. Each head, cab and combo offers all-tube guitar tone in a sleek design inspired by classic Ampeg guitar amps from the '70s. "Each head, cab and combo offers all-tube guitar tone in a sleek design inspired by classic Ampeg guitar amps from the '70s"
"The comprehensive line of Ampeg GVT guitar amps ranges from an ultra-compact five-watt head, all the way up to a gig-friendly 50-watt, 2x12 combo. GVT heads and combos are all-tube by design, including 6V6 and 6L6 power tubes for unmistakable American feel and tone. "The tonal palette is wide, featuring Ampeg's legendary Baxandall EQ circuitry, which provides unmatched flexibility, allowing the guitarist a much wider range of tones than competitive amps. "Both GVT extension cabinets feature Celestion Vintage 30 speakers, while GVT combos use Celestion Original Series speaker designs, perfect for translating the feel of the all-tube GVT amplifiers. Plus, rugged build quality ensure years of use out on the road. 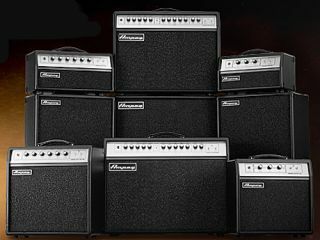 "Available later this summer, the Ampeg GVT Series will launch with eight different models: the GVT5H and GVT15H heads, GVT112E and GVT112EW cabinets, plus the GVT5-110, GVT15-112, GVT52-112 and GVT52-212 combos. Ampeg GVT pricing is TBD at this time." Stay tuned to MusicRadar for an exclusive video demo of the GVT series in action amongst the Musikmesse video highlights from day one of the show. In the meantime, visit Ampeg's Facebook page for a chance to win Ampeg gear, including an all-new GVT Series amplifier.